Phil O’Keeffe is well into his second decade of coaching boys volleyball at Fox Chapel. So his calling the current group of Foxes the youngest team of his tenure is a significant statement. A batch of players that includes one senior, two juniors and more than a dozen sophomores and freshmen is learning on the job this spring as Fox Chapel attempts to compete for a WPIAL playoff spot in the rugged Section 2-AAA. Fox Chapel (0-1, 0-1) began its section season with as big a test as any, dropping a 3-0 decision to perennial power North Allegheny. But while O’Keeffe said the Foxes’ inexperience showed, he considered it a good learning experience. The program’s playoff drought reached three seasons in 2018. Fox Chapel’s last postseason appearance, in 2015, ended with a WPIAL Class AAA championship and a PIAA runner-up finish. O’Keeffe, who also led Fox Chapel to a WPIAL title in 2006, compared his current group to the early years of the 2015 championship team. To help with the learning process, O’Keeffe whittled his roster down to a more manageable 17 players, comparing the group to something like a large club team, and got to work on instruction. O’Keeffe said Fox Chapel fared well in some early tests, including a 25-21 loss to PIAA power Central York in the playoffs of the North Allegheny Tournament, followed by the section defeat against North Allegheny, the two-time defending WPIAL champion. 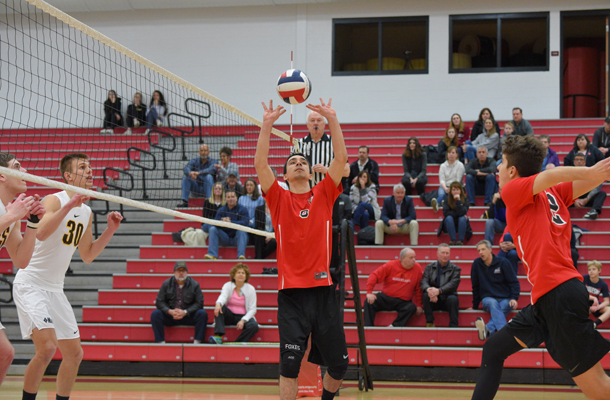 Junior outside hitter Patrick Kiszka stood out as the Foxes’ best player against North Allegheny, O’Keeffe said, and fellow junior John Mark Klamut had some good kill numbers and blocks. Those two will be joined on the hitting line by sophomore twins Arda and Kaya Akinci in the middle and sophomore Michael Tarasi, younger brother of former All-WPIAL hitter Raymond Tarasi, at opposite hitter. Freshman Eli Yofan, a basketball star for Fox Chapel this winter, could see time on the front line. Senior Dom Zacharias is Fox Chapel’s setter, and sophomores Brendan Gladwin and James Klatt are competing at libero. Fox Chapel has a big week in front of it with matches against Butler, Shaler and North Hills during the week and the Foxes’ host tournament Saturday. O’Keeffe said the key to the team’s success will be finding a way to coalesce as the season goes.